FOUNTAIN VALLEY, Calif., Nov. 12, 2018 — Pedego® Electric Bikes is introducing travelers to extraordinary vacation adventures touring the sunny Southern California Coast on Pedego electric bikes. This winter, fun-seekers eager to discover a new level of delight can sign up for two luxurious vacations featuring sumptuous hotels, captivating locales, celebrated restaurants and shopping as well as top-flight guided Pedego rides along spectacular coastal routes. Hosted by Pedego Corona del Mar, the first Pedego Adventure is slated for January 22–25 in Newport Beach. 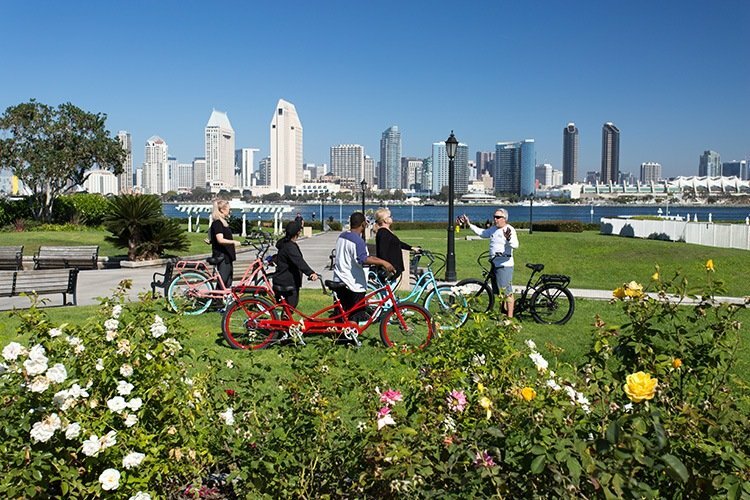 Hosted by Pedego San Diego, the second adventure will take place February 19–22 in San Diego. Guests in Newport Beach will enjoy a welcome reception, three buffet breakfasts, a farewell dinner at one of Newport’s top restaurants and three nights’ hotel accommodations at the Hyatt Regency Newport Beach Hotel. Guests will relax and unwind as they enjoy more than 55 miles of cruising along the shore in Corona del Mar, Newport Beach, Dana Point and San Clemente. Led by experienced electric bike cycling guides, the tour includes rentals of Pedego electric bikes plus helmets. Van support will be provided to assist riders, including water, snacks or a ride if they don’t feel like cycling. Guests in San Diego will enjoy a welcome reception, three buffet breakfasts, a farewell dinner at San Diego’s famous Fish Market and three nights’ hotel accommodations at the exclusive Spring Hill Suites Bayfront, San Diego. Year-round perfect weather and 70 miles of magnificent coastline, world-class attractions and a thriving urban center combine to make this an exciting vacation choice. Earning the nickname, “America’s Finest City,” San Diego boasts sophisticated art, dining and nightlife. Guided rides will take guests to see the USS Midway, Embarcadero parks with views of Coronado Island, historic Gaslamp District, Balboa Park, Little Italy, Harbor Island and more. Each Pedego Adventure is available at $1,450 per person for double occupancy and $1,750 for single occupancy. Participants will experience exceptional white-glove service as they enjoy fully-supported guided rides along picturesque bike paths. Spaces are limited, and reservations are on a first come, first served basis. “Pedego electric bikes empower virtually any rider to experience the joys of cycling along scenic bike paths, enjoying scenery that would be impossible to see by car and difficult to see by foot. Riders can choose to pedal or not, breezing through headwinds and conquering hills with ease,” said Pedego CEO and co-founder Don DiCostanzo. For more information on the trips, including the itineraries, visit the Pedego Electric Bike Adventures website. With more than 100 Pedego stores located near scenic bike paths, Pedego will soon be announcing additional Pedego Adventures nationwide.